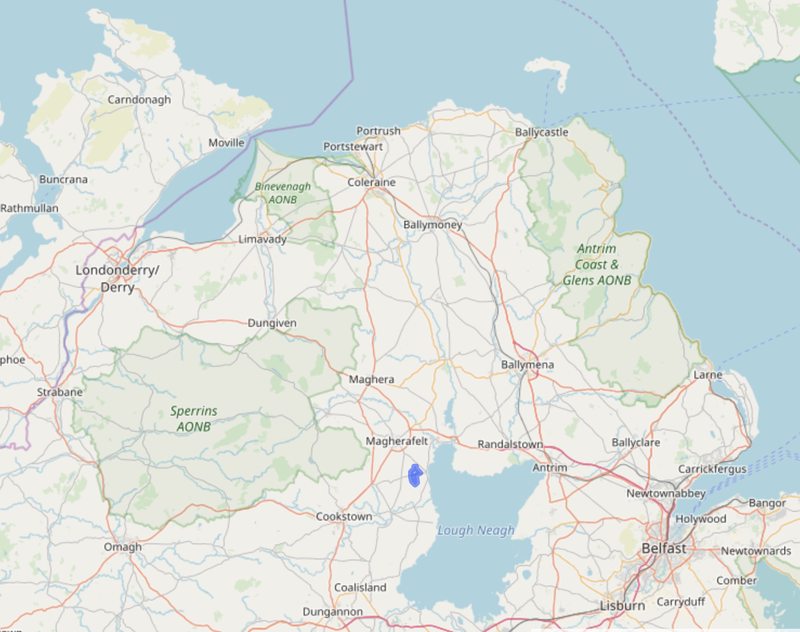 One Catholic Harbison (John) appears in the 1766 Religious Census for Londonderry. This is the transcribed record, courtesy of Bill McAfee. My working hypothesis is John is the ancestor of all of the Catholic East Derry and East Tyrone Harbisons, as well as most if not all of the Catholic Harbisons who emigrated to Philadelphia in 1816 and after. Here is the map from Griffith's Valuation of Ireland, almost a century later (1858), showing the townlands of Ballyneill More, Ballyneill Beg, and Ballyriff, with a bit of Lough Neagh stuck in to orient you. You can zoom in a bit. 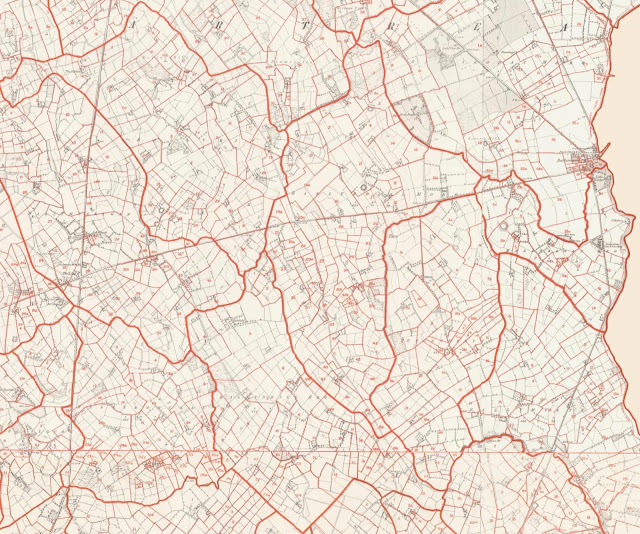 The townland names are not particularly easy to see, but they're there. The full map is available here. And here is Ballyneill More in the bigger scheme of things. It's the little purple blob. The Ballyneills are mentioned in the first layout of the land of the Plantation of Ulster, listed in the record of a court of Common Council of the City of London, held on 17 December 1613. This particular part of East Londonderry, originally belonging to the exiled O Neill, was granted by patent to the Worshipful Company of Salters, one of ten London companies. The territory of the ten companies, once part of Tyrone, was split off as the new county of Londonderry. T.W. 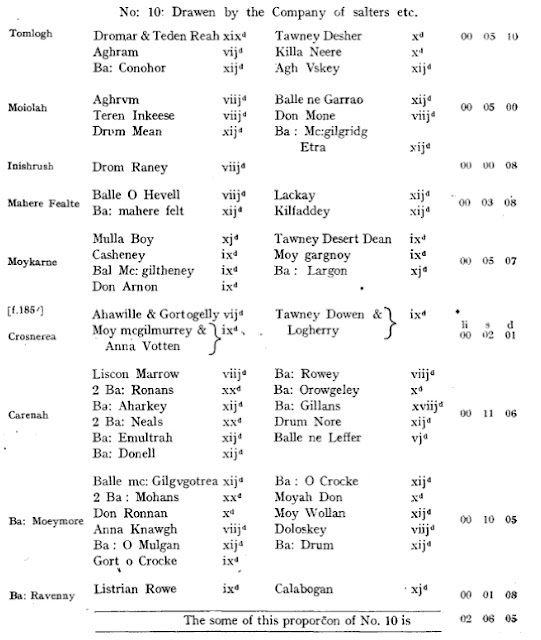 Moody, my old history professor at TCD, transcribed the record, and they appear in Schedules of the Lands in Ulster Allotted to the London Livery Companies. 1613, T. W. Moody. Analecta Hibernica, 8, 1938, 299-311. A protestant finally shows up in the 1662 Subsidy Rolls; his name is Humphrey Tracy, living in Ballyneill Beg. 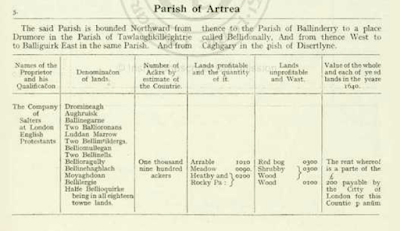 The valuation (5 pounds) is quite high; he must have owned a significant part of the townland. There were Tracys in ballyneill Beg until at least the late 19th century. He also shows up (as Humphrie Tracy) in the 1663 Hearth Money Rolls, along with two Irishmen, James McArt and Gillaspie McGuckin. Note that both rolls were means-tested, and so poorer people wouldn't have appeared. Unfortunately townlands were frequently unspecified in the 1740 Protestant Householder Rolls, but there are two Tracys in the parish of Artrea; likely one was in Ballyneill Beg. The 1766 Religious Census, though, is a boon; we count 56 head of households, 17 Established Church and 39 Catholics (papists); remarkably, there were no dissenters recorded. I will have more about correlating the 1766 Religious Census with the 1831 Census and the 1858 Griffith Valuation, since we have names; we may be able to get a better idea of where exactly John Harbison lived. 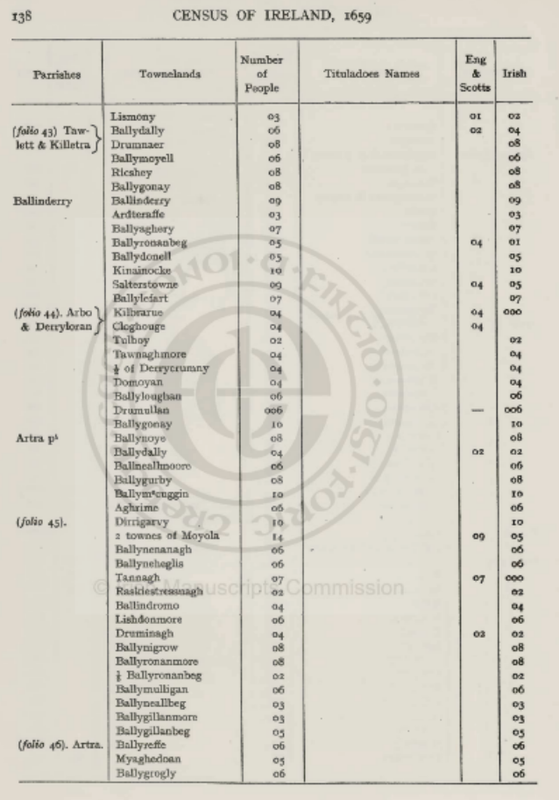 Anyway, to conclude our stroll down demographic lane, in the 1831 census, there were 39 households in Ballyneill Beg, 11 Established Church, 24 Catholic, and 4 Presbyterian (yay dissenters! ), for a total count of 61 Established Church, 126 Catholics, and 21 Presbyterians, or 208 individuals on 480.49 acres, a density of one person per 2.31 acres. 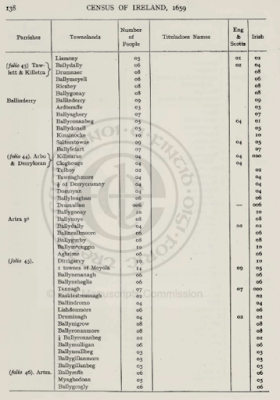 There were 47 households in Ballyneill More, 19 Established Church, 24 Catholic, and 4 Presbyterian, for a total count in both townlands of 86 households. In Ballyneill More, there were 113 Established Church, 134 Catholics, and 21 Presbyterians, or 268 individuals, on 632.78 acres; a density of one person per 2.36 acres. This is an unsustainable density in a rural area, and directly led to the Great Famine of 1845-1848.